At the preparatory meeting for the Global Fund’s Sixth Replenishment, held on 7–8 February 2019 in New Delhi, civil society organizations called for a “bold” replenishment target of $18 billion. This is $4 billion higher than the $14 billion target announced by the Global Fund. An investment of $14 billion would not allow for scaling up programs to put countries on track to reach the 2030 targets for the three diseases, the CSOs said. Sierra Leone made significant progress in its health programs between 2000 and 2014, but the country’s devastating Ebola outbreak in 2014 caused major disruptions to all health services, the OIG said, in the report on its first country audit of Sierra Leone. The entire country is still engaged in recovering from the adverse effects of the outbreak, the report says, with stalled progress on HIV and TB just one of its countless damaging consequences. Transition out of Global Fund support to a wholly domestically-funded TB program in Fiji was made possible by a three-year preparation process, using guidance from the Eurasian Harm Reduction Transition Preparedness Tool. Over 90% of the transition plan has now been implemented, covering eight key areas identified by the Fiji Country Coordinating Mechanism in collaboration with the Fiji Ministry of Health and Maternal Services. The last area still to be addressed is that of the role of the Country Coordinating Mechanism in providing oversight to all communicable disease programs in Fiji after transition. HIV incidence is on the rise in Eastern Europe and Central Asia, with the MSM population acknowledged as the main driver of the HIV epidemic in that region. There is no reliable evidence base for prevalence figures in the LGBT community, but it is clear that increased vulnerability of the MSM and LGBT communities to HIV-infection is strongly linked with negative attitudes to these communities expressed by the state and by parliamentary officials, and with the lack or inadequacy of specific health services. The GFO talked with experts from the Eurasian Coalition of Male Health to explore what is behind the numbers and statistics. This is the third in a series of interviews with the Senior Disease Coordinators at the Global Fund to Fight AIDS, Tuberculosis and Malaria. In this Q&A, Friends spoke with Dr. Ade Fakoya, the Senior Disease Coordinator specializing in HIV/AIDS, about the opportunities to fight AIDS covered in Friends of the Global Fight’s report, "At the Tipping Point: U.S. Leadership to End AIDS, Tuberculosis and Malaria". In this collection of links to other publications’ coverage of the African Union Leadership meeting, “Investing in Health”, held in Addis Ababa on February 9, we highlight articles from AIDS Africa Watch and Devex, and a news release from the Global Fund. They describe the meeting’s focus on strengthening African countries’ own commitments to reaching Universal Health Coverage, and to increasing domestic investments in health as a greater percentage of the gross domestic product of each country. The 2014 Ebola outbreak in Sierra Leone has substantially compromised its ability to successfully implement its Global Fund grants, the OIG has found, especially on cross cutting health-system-strengthening key deliverables. At the same time, the OIG said, “various layers of financial controls” are not operating effectively to mitigate key financial and procurement risks. Acknowledging that the Ebola outbreak stalled the country’s progress on HIV and reduced TB services, the OIG noted that the country, and the health sector in particular, is still in the process of recovering from the “adverse effects of the outbreak”. The report on the OIG’s first-ever audit of Global Fund grants to Sierra Leone, was published on 18 January 2019. The audit aimed to assess the “design adequacy” of implementation and assurance arrangements, program management and monitoring processes of the three diseases (quality of service to patients and accurate and timely data), and supply chain mechanisms for medicines. The Global Fund currently provides funding for 90% of the country’s HIV program, 70% of the TB program, and 74% of the malaria program. Note: 1) The new HIV grant signed with the NAS for 1 January 2018 to 31 December 2020, for $31,799,803, was not included in the audit scope as it had only just begun at the time of the OIG’s fieldwork for the audit. The OIG’s audit covered just under two years of grant implementation, from July 2016 to March 2018, and three Principal Recipients and their sub-recipients. During the OIG team’s fieldwork, they visited 12 warehouses, district offices and health facilities in three of the highest-burden districts for TB and HIV. Achievements in its malaria program appear to be Sierra Leone’s biggest success, with Global Fund support for malaria having led to “significant reductions” in malaria incidence and mortality (50% and 40%, respectively), the OIG said, mainly through improvements in prevention and treatment activities. Though among the top 30 high-burden countries for TB, Sierra Leone made major gains in reducing TB morbidity and mortality between 2000 and 2014, and the TB treatment success rate remains more than 80%, despite the damaging impact of the Ebola outbreak. In addition, the OIG commended “lessons learned from the Ebola outbreak”, specifically the MoHS’s strategy to build resilient and sustainable systems for health, and the Health System Recovery Plan (2015-2020). Gaps in the design and implementation arrangements and management of the HSS grant funding: The OIG said this grant had not been adequately planned and executed within the current implementation cycle, noting that the short (two year) grant period, delays in establishing a program management unit, and weak coordination were some of the factors contributing to only 24% of grant funds being absorbed by December 2017 (this improved to 68% by June 2018). Key cross-cutting interventions had been delayed. Absence of consolidated donor budgets and accountability: Implementers had not developed consolidated donor funding maps and procurement plans, the OIG said, acknowledging that this has been made more difficult by increased donor funding both during and after the Ebola crisis. TB and HIV programs not meeting targets: Partly because of the TB response “collapsing” during the Ebola crisis, TB notification remains low, while ambitious targets for HIV key population interventions have not been achieved (see 4.2 and 4.3 in ‘Findings’ below). But the OIG notes that the new 2018-2021 grants have been designed to address specific gaps. Ongoing need for stronger data and surveillance systems: Challenges persist regarding the quality of data and parallel reporting systems, the OIG said, despite an allocation for HSS grant support. Supervision budgets for data quality checks at health facility, district and central levels have been incorporated within the new Global Fund grants. Objective 1: The design adequacy of the implementation and assurance arrangements in supporting the achievement of grant objectives and sustainability of the programs “needs significant improvement”. Objective 2: The program management and monitoring processes of the three diseases to ensure quality of services to patients and provision of materially accurate and timely data for decision-making were rated “partially effective”. Objective 3: Supply chain mechanism in ensuring timely provision of good-quality medicines to the patients of the three diseases “need significant improvement”. The Global Fund has signed more than $304 million and disbursed over $248 million to Sierra Leone since 2006, across all three diseases as well as health system strengthening (HSS). The combined value of the three currently active grants is $106.5 million (see Table 1 above). Until 2014, Sierra Leone, classified as a low-income country, had sought to become a middle-income one. But the Ebola outbreak that year (the largest and longest in history) devastated health infrastructure and the country’s economy as a whole, while causing almost 4,000 deaths. GDP dropped from $5 billion in 2014 to $3.8 billion in 2017, and the currency depreciated by 29% as of December 2016. The population of the country is 7.4 million, and Sierra Leone is ranked 179 out of 188 countries in the UNDP’s Human Development Index. It is classified as a “core” country for the Global Fund (larger portfolio, higher disease burden, higher risk), and a Challenging Operating Environment. The OIG’s findings across all five specified areas are richly detailed (see section 4, on pages 11-20 of the report, especially section 4.1); below we summarize the ‘headlines’ of these findings. In 2014, a Joint Financial Management Assessment (initiated by the MOHS and supported by the Global Fund, Gavi, the World Bank and the WHO local office) recommended the creation of the Integrated Health Projects Administration Unit (IHPAU), to optimize the financial management and administration of all donor-supported programs. Still, the OIG highlighted the need for Sierra Leone to strengthen implementation and assurance arrangements, relating to challenges including a lack of an overall view of program activities, delays in key grant activities, insufficient quality of Principal Recipient documentation and Fiscal Agent review of grant expenditure. TB case detection challenges, in the context of Sierra Leone’s achievement of 85% of the case notification target, have root causes including community-referred patients not being tested because of limited access to service delivery points (only 13% of 1,360 health facilities in the country are DOTS treatment centres, and there is only one MDR-TB facility), and inadequate childhood TB coverage (childhood TB activities are not included in the program budget, despite childhood TB incidence representing 12% of the total case load). Though an ‘HIV catch-up plan’ is underway, treatment access and retention remain problematic, with 30% of patients lost to follow up (a 21% increase since 2014); a decline in treatment retention from 74% to 56% for people on antiretroviral therapy over the previous 5 years (two different cohorts with different start dates); and a decline in survival rates for adults on treatment from 72% to 52% after the 24-month period. In addition, challenges remaining relating to community health workers (CHWs) – training, availability of reporting tools, integration of CHW cadres across diseases and patient tracking – with no mechanism having been implemented to furnish CHWs with lists of patients lost to follow up so that CHWs could contact, visit or counsel them. Improved quantification tools and support available to national programs through the Global Fund’s pooled procurement has helped ensure timely supply of medicines and commodities, the OIG said, with orders and supplies for malaria and TB medicines in line with annual procurement plans and forecasts. However, key issues in Sierra Leone’s supply chain management include stockouts of HIV drugs and expired medicines not returned or destroyed. These issues, the OIG said, were due (among other reasons) to limited availability and use of reliable data affecting quantification, weaknesses in inventory records, and limited integration and coordination across programs in aggregating, analyzing and making use of supply chain logistics data for reporting and decision-making. Cases of inaccurate reporting for HIV were picked up. AMA 1: The IHPAU and the NAS as Principal Recipients should develop a procurement plan for Global Fund grants; a work plan for the grants’ key activities; an activity-level donor map for all funding received by IHPAU for the current grant cycle; and an approved supplier list based on a well-documented selection process. AMA 3: The PRs will work with the National Quantification Technical Working Group to ensure the use of data to inform decision-making for the management of Global Fund products, with particular attention to be paid to the reporting rate of LMIS tools from health facilities to districts, to central level, and to the use of the information derived from these tools to inform forecasting. AMA 4: The PRs will develop a comprehensive data quality improvement plan. All the AMAs are ‘owned’ by the Head of Grant Management and are due to be completed by 31 December 2019. Editor’s Note: This article does not address progress made on issues identified by the OIG in its 2014 investigation into allegations of procurement irregularities and invoicing fraud in Round 7 malaria and TB grants (see GF-OIG-14-005). See section 3.3 of the audit report. 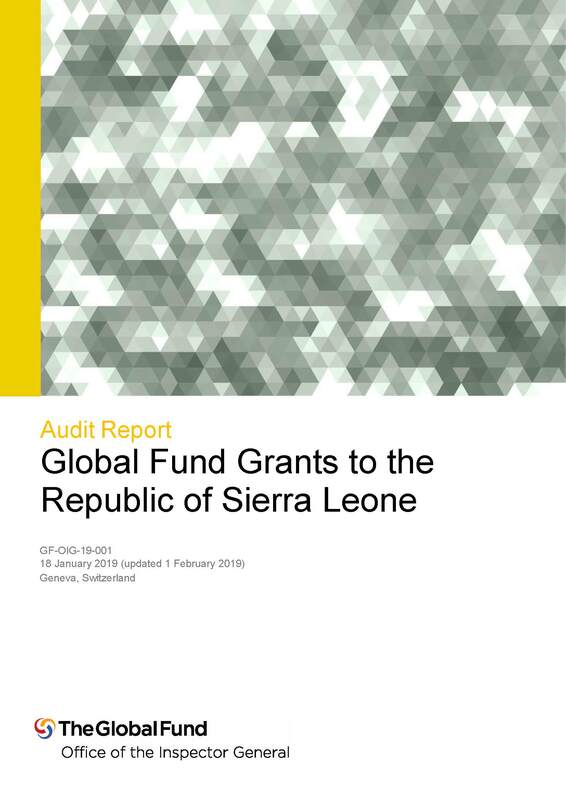 The full report of the Office of the Inspector General’s audit of Sierra Leone’s Global Fund-supported grants is accessible on the Global Fund website.